What do Alan Dershowitz and Russia's Chief Rabbi Have in Common? Yesterday, in honor of Lag B'Omer I visited the Rebbe at the Ohel, his gravesite in Queens, as I often do on special days. A few guys from the morning "Shmooz & Shmear" torah study group joined me. It was a special trip for all of us. It was special to Michael because it was his 48th wedding anniversary; it was special to Scott because this was his maiden voyage to the Ohel; and it was special to Sanford because every day is special to Sanford. 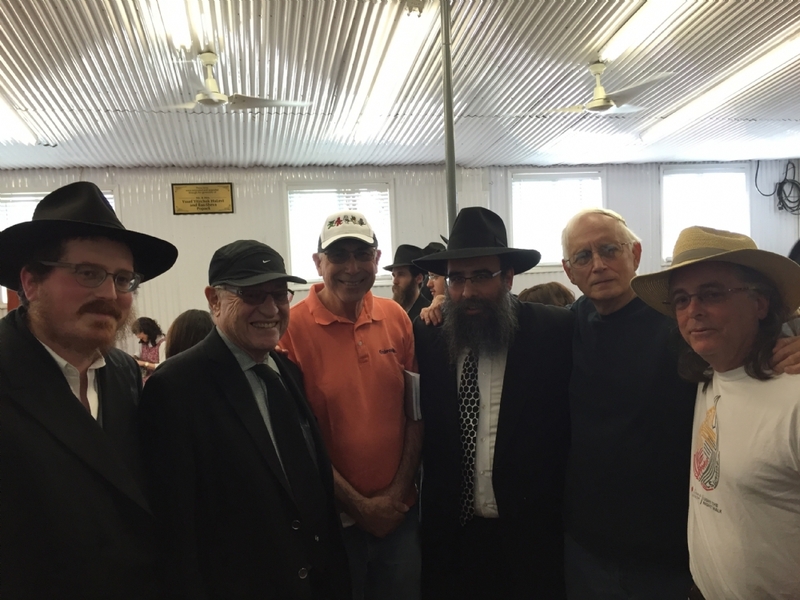 As I scanned the large crowd milling around the visitors center, I notice my dear friend and mentor Rabbi Berel Lazar, Chief Rabbi of Russia and Chabads chief emissary there. I introduce our group to him; the guys are delighted. Next we get introduced to Alan Dershowitz. We take a picture and thank him for his efforts of fighting anti-Semitism and anti-Israel bias, especially on college campuses. I mention my good friend (Chabad Board members) Alan Rosenzweig who I know was Dershowitz's classmate in college; Alan remembers Alan well. He even remembers me re-introducing the men to one another at a Shluchim convention about ten years ago when Dershowitz served as key note speaker. On the ride home I can't help but think: Wow, what a Rebbe! What a great leader the Rebbe is, who twenty years posthumously brings together people and leaders from all over the world, as diverse as these two men are; as diverse as the four men sitting in my car on the drive home; inspiring each in their own unique mission to help strengthen our people and our faith. We're all different and unique. Each of us can make a contribution. Each one counts. Each is needed to accomplish the mission and finally bring Moshaich! Rabbi Paltiel, Michael Greiff, Scott Matty and Sanford Lewis meet the Chief Rabbi of Russia Rabbi Berel Lazar, and Attorney Alan Dershowitz. 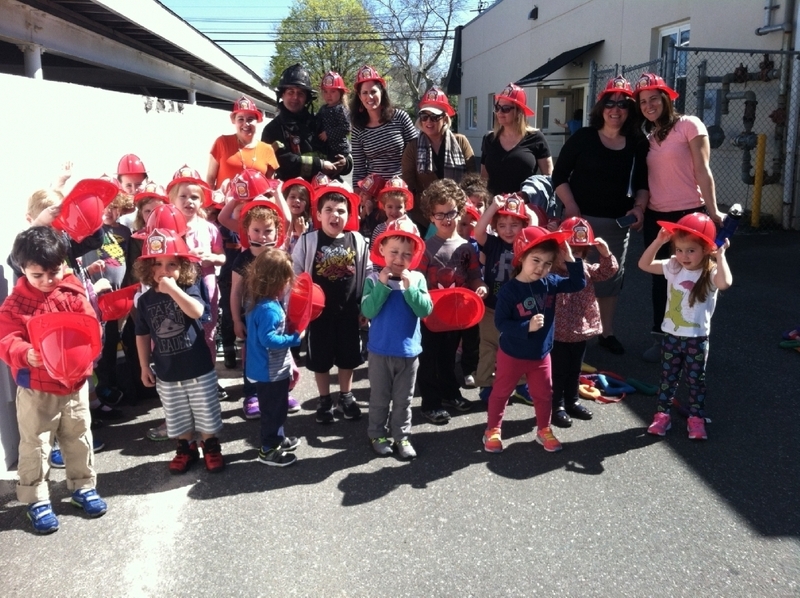 Enjoying a Fire Drill on a beautiful Spring Day courtesy of our very own Fire Fighter Chris Ferraro (dad of one of our Preschoolers). Looking to "de-clutter"? Welcome to Chabad's CLUTTERFREE program, it's never been easier! We're excited to share with you that Chabad of Port Washington has joined forces with CLUTTERFREE to turn your "once cherished" items into cash! If you have items of value that are no longer wanted in your home or office, you may want to consider donating them to be sold on ebay for CHABAD'S benefit. 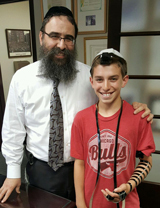 This is an ongoing effort to raise funds for Chabad of Port Washington. There is no time limit to receiving items for sale. CLUTTERFREE: Donna Benabou, 516-551-5785 or email clutterfree@chabadpw.org. Click here for more info about the Sisterhood. Question: Why do the Jewish people seem to loom so large on the world stage? The numbers don't add up. Here's a nation that comprises less than 0.2% of the world's population, yet we command so much attention you'd think there were billions of us. That's like a room of two thousand people, with one puny guy sitting in the corner whom everyone wants to talk to (or pick on)! Mazel tov to proud parents Dolio (aka Avraham Yariv) and Danielle. Click here to let us know if you can sponsor a kiddush. *CLICK HERE to convert any regular calendar date, birthday or Yahrtzeit to its corresponding Jewish-calendar date! Rabbi Y: Why Do Jews Still Insist on Speaking Yiddish? Why are Jewish people living in the United States speaking German? Can't they speak in English, or at least Hebrew? Join the sages of yesteryear as they explore the deeper meaning of this week's Parshah. As quoted from the Talmud, Zohar, Maimonides, the Code of Jewish Law, and more . . .
Our job is not to have faith. We have faith already, whether we want it or not. It comes in our blood from our ancestors, who gave their lives for it. Our job is to transport that higher vision that gave them their faith down into our minds, into our personalities, into our words, into our actions in daily life. To make it part of our selves and of our world. The Torah section of Emor (" Speak") begins with the special laws pertaining to the kohanim ("priests"), the kohen gadol ("high priest"), and the Temple service: A kohen may not become ritually impure through contact with a dead body, save on the occasion of the death of a close relative. A kohen may not marry a divorcee, or a woman with a promiscuous past; a kohen gadol can marry only a virgin. A kohen with a physical deformity cannot serve in the Holy Temple, nor can a deformed animal be brought as an offering. A newborn calf, lamb or kid must be left with its mother for seven days before being eligible for an offering; one may not slaughter an animal and its offspring on the same day. The second part of Emor lists the annual Callings of Holiness-the festivals of the Jewish calendar: the weekly Shabbat; the bringing of the Passover offering on 14 Nissan; the seven-day Passover festival beginning on 15 Nissan; the bringing of the Omer offering from the first barley harvest on the second day of Passover, and the commencement, on that day, of the 49-day Counting of the Omer, culminating in the festival of Shavuot on the fiftieth day; a "remembrance of shofar blowing" on 1 Tishrei; a solemn fast day on 10 Tishrei; the Sukkot festival-during which we are to dwell in huts for seven days and take the "Four Kinds"-beginning on 15 Tishrei; and the immediately following holiday of the "eighth day" of Sukkot ( Shemini Atzeret). Next the Torah discusses the lighting of the menorah in the Temple, and the showbread (lechem hapanim) placed weekly on the table there. Emor concludes with the incident of a man executed for blasphemy, and the penalties for murder (death) and for injuring one's fellow or destroying his property (monetary compensation).